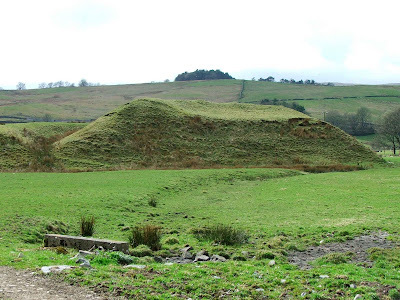 About a half mile North of Tebay, and just off the A685 in Old Tebay, the remains of Castle Howe sit on the banks of a fledgling River Lune and Birk Beck. Where the two rivers meet would have been well guarded by the castle, although both rivers have long since shifted their courses. 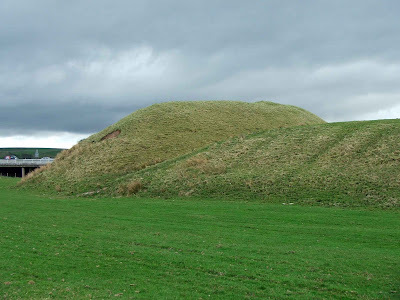 The Lune for example has moved nearer to the North side of the motte, and has consequently eroded at least half of the 6 metre tall mound. The remaining earthworks are none the less quite spectacular. They are visible from North and South bound traffic on the M6 motorway just by junction 38. The motte stands to an impressive 6 metres tall, although it is now crescent shaped rather than round as it would originally have been. The top of the mound appears to have been scooped, indicating the remains of a breastwork, or embankment providing further protection to the summit of the motte. The bailey lays to the South of the motte, and the two areas are separated by a ditch some 6 metres wide and around 2 metres deep. The bailey is huge, and distinctly crescent shaped....although again, whether this is down to design or erosion is difficult to tell. The bailey stretches South all the way to the motorway embankment, and measures roughly 133 by 61 metres, and is raised above the surrounding fields by about 2 metres. There are numerous earthworks surrounding the remains, including deep ditches and high banks, but seeing as the site is so close the motorway, it's difficult to tell if these are as a result of the building of the M6, or part of the original castle's defences. It is believed that the castle was the seat of the de Tybai, or Tibbay, family in the 12 century, with historical documents mentioning a Herbert de Tibbay and his son Richard in 1201. It isn't the only defensive structure in the area. About a mile to the West, and on the banks of Birk Beck, lay what are described as the remains of a second unfinished motte and bailey, Greenholme. This motte has a huge summit, measuring around 23 by 9 metres, but doesn't appear to have any earthwork defences. Local tradition holds that these two motte and bailey castles were used to halt the advances of successive Scottish armies on their way South.
. 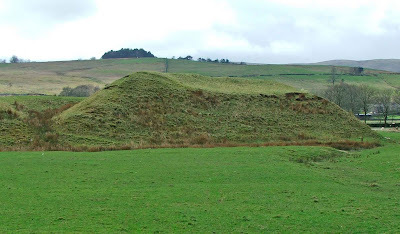 The remains are accessible via the footpath that runs from Old Tebay just off the B6260, passing along the base of the motte, and right through the bailey. This castle is well worth a visit.